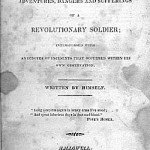 Joseph Plumb Martin (1760-1850) was a New England farmer who served as a volunteer soldier in the Continental Army during the Revolutionary War. Martin was born on the western fringe of Massachusetts but spent most of his childhood in Connecticut. His family were affluent enough to provide him with a rudimentary education. The outbreak of the war with Britain fascinated Martin and he left home to enlist in late 1775, shortly after his 15th birthday. He served with the Connecticut militia for a year, most of which was spent in New York. After completing his initial enlistment Martin rejoined the Continental Army in 1777. He would serve for the duration of the Revolutionary War, seeing action in several major engagements including the Battle of Monmouth, the siege of Yorktown and the winter encampment at Valley Forge. Martin was discharged from the Continental Army in June 1783. He settled on farmland in south-central Maine, near Bangor. Martin became influential in his community, serving as a selectman and a justice of the peace. 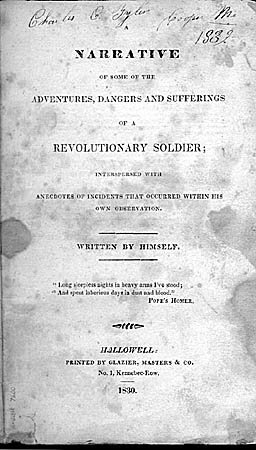 In 1830 he published an account of his service in the Revolutionary War, titled “A Narrative of Some of the Adventures, Dangers and Sufferings of a Revolutionary Soldier, Interspersed with Anecdotes of Incidents that Occurred Within His Own Observation”. Martin’s book sold poorly during his lifetime but was discovered and republished during the mid 20th century. It is one of the best known and most studied accounts of life in the Continental Army during the Revolutionary War.